Work on our design for the River Thames passenger boat continues with trips to Cornwall to oversee the build process. This year also saw the oversee of the build, delivery and commision of two wide beam narrow boats. These boats were built near Liverpool and delivered to the Thames near Reading early in the year. Planning and cost estimates for the forthcoming major refit of the gas turbine yacht 'Brave Challenger' have been carried out with a view to have the ship up and running on gas turbines next year. This year saw the completion of our design for the River Thames passenger boat. After a round of quotations and visits C. Toms & Sons of Polruan, Cornwall were chosen to build the new boat. In August a formal keel laying ceremony took place at the boatyard and this can can be viewed here. The new boat now has a name 'Thames Discoverer' and will be ready for operation in April 2017. In September we undertook the project management of the lift-out and underwater refurbishment of the 31 metre gas turbine powered ship 'Bave Challenger'. The ship had been afloat for some 18 years and therefore needed a great deal of attention. Fortunately, the underwater hull and sterngear were found to be in very good shape under the extensive coating of mussels! This work also allowed for an extensive plan to be produced that will form the basis for a more extensive refit in 2017. May of this year saw the commissioning of the Marine Society and Sea Cadets new sailing ship 'TS Royalist'. Westbrook Marine Projects Ltd worked closely with the owners to provide technical support for all the sailing aspects of the new ship which is now fully operational. 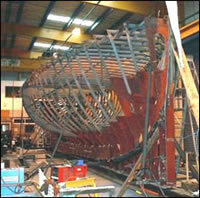 Support included several visits to the shipyard in Spain to monitor construction and trials. The end of this year has also seen the completion and deployment of the wooden yacht Boleh (see Boleh Project). Boleh is now based in Falmouth providing sail training for a local charity. We have been continuously involved in the design, commissioning and technical support of this fascinating project since 2011, providing drawings, calculations and technical manuals to the restoration team. Our first full design this year is for a 20 metre boat that will carry able-bodied and disabled passengers on day cruises on the River Thames. At the start of the year we carried out an inclining test and supplied the report for another of the Archer Class patrol boats; this time for 'HMS Dasher'. This year brings a significant amount of work supporting the major refit of the sailing vessel 'Kaskelot'. We have been contracted to design complete new engineering and electrical systems that will be part of major work to enable the ship to carry out a 2 year circumnavigation. We will be designing the mechanical and electrical systems for a run of custom built high quality 18 metre motor yachts. Stability work continues this year when we carried out a heel test and updated the Stability Book of the 20 metre motor yacht 'Rum Jungle'. The big project this year and next will be working with the Marine Society & Sea Cadets in the bid process and eventual build of a replacement sailing ship for their 'TS Royalist'. We will be part of the Owner's Representative (Customer Friend) team with special responsibility for all sailing aspects of the new ship. This year brought another naval project in designing a new sonar transducer installation for 'HMSL Gleaner'. Stability calculations to enable the sailing ship 'Lord Nelson' to operate in the waters of Antarctica. Stability diagrams to illustate flooding conditions for a 90 metre Superyacht. A full Stability Book written for a new 33 metre Looe Lugger wooden sailing vessel. Our most prestigious project this year is the full design of the engineering and electrical sytems for the Queen's Row Barge 'Gloriana'. This will include an original all electric propulsion system. Our first ever work on a naval vessel saw us carry out an inclining experiment on 'HMS Ranger', an Archer Class patrol boat, and prepare a report of same. We are continuing with the full design of a replica of the 'Mayflower'. The new ship will be built by The Harwich Mayflower Project in time for the 400th anniversary of the original voyage. Construction will be in timber using traditional methods. Fully operational, the ship will undertake trans-atlantic voyages and be fully MCA compliant. Another of our full design projects this year is for a 60 foot (18.3 metre) all steel motor sailer, the Westbrook 60, for an American client. Keeping with the motor sailer theme we are also producing the design drawings for a wooden boat based on a traditional MFV style hull. Designed for semi-production allowing flexibility in layout, these boats will be built by T. Nielsen & Co. in Gloucester and fitted out to the highest yacht standard. Also this year we carried out a valuation survey and report on a 55 metre square rigged sailing ship. We were appointed as Naval Architects for the full restoration of a 12.5 metre wooden sailing yacht originally built in 1950. Our initial task will be to help secure Stage 1 and Stage 2 Heritage Lottery Funding before moving on to prepare all necessary design support. See the Boleh Project here. We have been commissioned to carry out the full design of a replica Elizabethan merchant ship. Built in timber using traditional methods, the ship will be capable of transatlantic sailing and meet all MCA requirements. The second project is to design a semi-production classic motor-sailer, also in timber, that will be fitted out to the highest standard. More information will follow as these two significant designs are progressed. Also this year saw the overseeing of a refit and production of a full operating manual for an Oyster 65 yacht. After recent investment in new software, hardware and training, WESTBROOK MARINE PROJECTS can now offer a full 3D CAD, CAM and CNC service. This new facility not only supports our marine design activities but provides a service to other areas of design such as mechanical, architectural and structural. Design capabilities range from small single components right up to 3D assembly views of ships, yachts and other large projects. We offer a low cost, quick turn round of all work, providing output such as accurate detailed production drawings, IGES files for CNC machines and high quality visualisations. If you need to turn ideas into working drawings for just a single item, a complex assembly or a major project please e-mail for a free estimate and examples of our work. All our 3D design work can include strength analysis and weight/cost optimisation if required. WESTBROOK MARINE PROJECTS has completed the design and the build supervision of the LEONARD MATCHAM. This vessel is an MCA approved Class V passenger vessel, operated by the WILLOW TRUST and designed to carry up to 50 passengers (both able and disabled) on day trips. Many special features were incorporated in the design including a passenger lift, adjustable steering position and overhead lifting tracks. We have a great deal of experience in designing for people with disabilities and can include features such as Braille identification, talking compasses and high visibility features. The lower picture shows the early stages of construction of our traditional styled sailing cutter. This new in-house design is 22 metres (72 feet) long and will be fitted out for world cruising. Apart from total design packages, we have recently designed the engineering systems for a large wooden schooner. This splendid yacht is being built by DSV YACHTS in Turkey. All engineering systems design, machinery layouts and equipment specifications were provided. We have also produced a complete set of engineering and electrical system drawings for the refit of the beautiful yacht HALCYON. This very impressive charter yacht has just completed an extensive refit at the yard of T.NIELSEN & COMPANY in Gloucester. Drawings provided by us included new fresh water, waste water and fuel systems along with electrical schematics for both AC and DC wiring. Technical support for various other parts of the refit, including equipment selection, was also provided.